It’s easy to begin work and then Focus so much with your head down you realize you haven’t been updating others as to what is going on. I found this to be the case. Therefore, I wanted to give you an inside look at what I’ve been building. I’ve been working for the last couple of months to finish up a course that I’ve been building over the last two years called Freelance jumpstart. We course teaches creative entrepreneurs how to build a business from scratch in Thrive as a creative who works with high-value clients. My process consists of three parts writing recording video in editing and finally setting up the lessons on the course. That’s a quote I often hear from Sean McCabe, but it could not be any truer. No matter what your building everything does begin with writing and building my course has been no different. 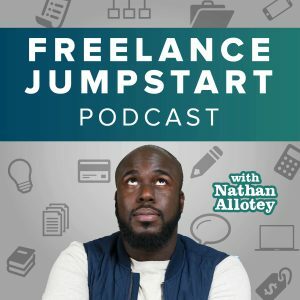 I went through the process of validating whether or not building an online course would be worth it by observing current search Trends on Google for freelancing and creating Freelance Jumpstart TV. If you can’t validate there’s interest, then there’s no point in starting. Ivan brainstormed about what I could create. I thought about creating a podcast, writing a book but later this idea evolved into building an online course. Once I validated my idea I had to do more than a little research to increase my knowledge on the subject so that I could teach on it but I also had to find out what other people wanted to learn about the topic of freelancing and starting a business. I use sources such as Reddit, iTunes, Google Trends, Amazon book sales and popular business podcast to determine what topics to cover. Once I did research, it was about narrowing down what exactly I was going to teach on, which led me to create a general outline of the topics I new word essential to what I was building. Outlining all of the information I knew it would be best to organize the topics in the form of book chapters. Creating book chapters allowed me to think about the order of information as well as how it builds upon one another. Once I have the outline and the Order of the information this then let Me 2 begin writing information about each of those topics. The thought was to write a general outline create chapters which gave the information order and then write some points to each of the points I made in the outline. This made writing easier because all I had to do was write to the specific subpoint and once I was done with all subpoints I would have a chapter. As I mentioned earlier, everything starts with writing. Because I had a chapter in sub-points of each information all I had to do was narrow down what parts of the information I wanted to cover in the video. Each video had a specific script, and the script was the outline of each chapter. The only difference is I found visual examples to cover since video format allows for more visuals. My process included recording the video, editing that the same video in Adobe Premiere Pro, and then exporting the audio and video. Initially, I found a way to transcribe the audio using Google docs for free. However, I found that this took up too much time and it was better for me to use rev.com as a service to transcribe the audio. The transcribed audio from Rev.com was 95% accurate. I still had to edit the text for grammatical errors. Even though the transcription was exactly what I said verbally in the video I may not have spoken as proper as I should have. Grammarly is a fantastic service I have used for some time, and it has made me a better writer. Grammarly checks for many things that Microsoft Word and Google Docs cannot see such as soon as structure vocabulary And overall comprehension. 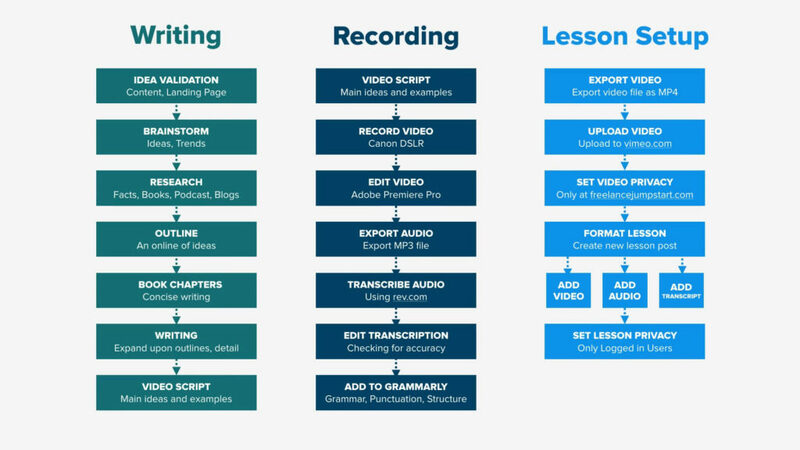 Each video that was transcribed was placed in Grammarly as a final check of what to fix. For the online course platform, I chose WordPress and used the plugin Restrict content Pro. I chose to use these two tools because it would allow me to create a course and have full control of customizing things how I wanted them to be. There are other course platforms out there, but for my first course, I felt this to be the best step to take. Since I already owned a vimeo.com account, I felt it best to use this again for the course. Vimeo is known for their high-quality video hosting, and I knew that I could privatize the course videos on Vimeo. There is a setting on Vimeo which allows you to change the privacy of each video and restrict it to only loading on only one a website. In this case, the videos will only work when the user is on freelancejumpstart.com.